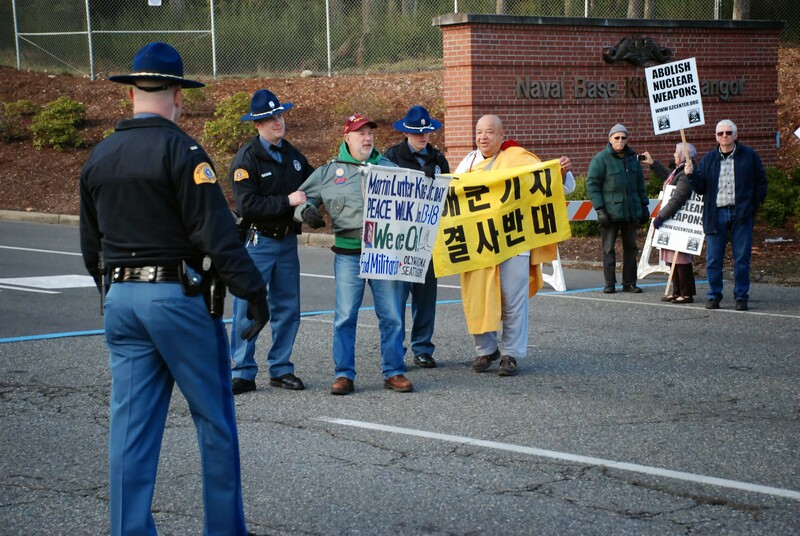 On January 18, 2014 activists from a Puget Sound-based nuclear abolition group engaged in a nonviolent direct action at the US Navy’s West Coast nuclear submarine and nuclear weapons base. The Trident submarine base at Bangor, just 20 miles from Seattle, contains the largest concentration of operational nuclear weapons in the US arsenal. Each of the 8 Trident submarines at Bangor carries up to 24 Trident II (D-5) missiles, each capable of being armed with as many as 8 independently targetable thermonuclear warheads. Each nuclear warhead has an explosive force of between 100 and 475 kilotons (up to 30 times the force of the Hiroshima bomb). 60 percent of the Trident fleet is based at Bangor, with 40 percent at King’s Bay, Georgia. Another participant, Tom Krebsbach, Brier, WA walked onto the base in an attempt to deliver a message, in the form of a poem, to the base commander. Naval security authorities arrested Krebsbach, and took him to a base facility for processing. He was released a short while later, after having been cited for Trespassing (18 USC 1382). 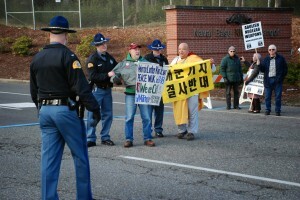 After Krebsbach’s arrest, one last resister entered the roadway carrying a sign reading, “Abolish Nuclear Weapons.” MacKnight Johnson, Silverdale, WA was also escorted from the roadway by State Patrol officers and cited. The day planned in honor of Martin Luther King Jr. began in the morning at Ground Zero Center for Nonviolent Action where participants screened “The Ghosts of Jeju,” a shocking documentary about the people of Jeju Island who are resisting the military advance on their island today, just as their parents and relatives did in 1947. Participants included members of the Martin Luther King Jr. Peace Walk that had walked from Olympia to Ground Zero Center, beginning on January 13th. The walk was led by monks from the Bainbridge Island Nipponzan Miyohoji Buddhist Temple. Ground Zero also hosted an ecumenical gathering organized by William “Bix” Bichsel, SJ, of the Tacoma Catholic Worker on January 15th (Dr. King’s birthday). Fr. Bichsel led a shared Eucharist at the Bangor base Main Gate bringing people together in witness against nuclear weapons and in solidarity with the struggle of the people of Jeju Island. On Monday’s legal holiday recognizing Dr. King, Ground Zero Center participated in the Seattle MLK Rally & March, carrying a full-size (44 feet in length) Trident II D-5 missile and handing out leaflets calling on people to join in efforts to build a nuclear weapons-free world. Ground Zero holds three scheduled vigils and actions each year in resistance to Trident and in protest of U.S. nuclear weapons policy. The group has been engaged in a continuing legal struggle to stop construction of a Second Explosives Handling Wharf at Bangor. Ground Zero is also working, through its “NO To NEW TRIDENT” campaign, to de-fund the Navy’s plans for a next generation ballistic missile submarine, estimated to cost approximately $100 billion to build. Building a new generation of ballistic missile submarines will undermine nonproliferation efforts and will increase the risk of either accidental or intentional nuclear war. On January 20, about 40 people stood at the main driveway entrance to Lockheed Martin as the voice of Dr. King was loudly amplified. The group held banners and signs emphasizing the fundamental connection between poverty and economic injustice with war-making and corporate profits – a connection that was to occupy Dr. King’s voice during the last years of his life, and was especially articulated in his profoundly prophetic “Beyond Vietnam: A Time to Break Silence” speech on April 4, 1967 (a year before his assassination)å. People chanted “Honor Dr. King’s Legacy, Wage Justice and Peace, Resist Lockheed Martin”, next to a bold wooden sign with the Lockheed Martin logo reading “We’re Making A Killing” and a 20 foot long banner of a bar graph depicting the greed and obscenely disproportionate amount of Federal dollars going for military purposes compared to domestic needs. They listened to readings by radical historian Howard Zinn (August 24, 1922 – January 27, 2010), some songs by Brandywine troubadour Tom Mullian, and participated in our King Day Memorial Litany built around Dr. King 1964 Nobel Peace Prize Speech. Following the Litany, those prepared to face arrest stood with pictures and quotes of Dr. King and banners, blocking the company’s main driveway entrance while listening to excerpts from Dr. King’s 1967 speech at Riverside Church. After taking a few steps attempting to walk up to the Lockheed Martin complex, they were stopped, arrested by the Upper Merion Township police, and taken to the police station where they were released after receiving disorderly conduct citations. Arrested were Bernadette Cronin-Geller, Sylvia Metzler, Father Patrick Sieber, OFM and Robert M. Smith, all of Philadelphia, PA; Annie Geers and Paul Sheldon, of Media, PA; and Tom Mullian, of Wyncote, PA. This is the 37th consecutive year that the Brandywine Peace Community has held a peace demonstration and time of nonviolent resistance honoring Dr. Martin Luther King, Jr. and his legacy of justice, peace, and nonviolent action. For the past twenty years, our Martin Luther King Day commemoration has been at Lockheed Martin, as part of the continuing campaign to stop the U.S.’s number #1 military contractor and worldwide arms dealer, the country’s chief nuclear weapons contractor and among the top manufacturers of drone war technology (from drone aircraft and the deadly Hellfire missiles to the satellites which direct the remote-controlled drone strikes from the continental U.S. against people thousands of miles away). Presente – Mary Jo McArthur (Oct. 22, 1947 – Mar. 23, 2013). She prayed, walked, resisted, got arrested and went to jail for peace, year after year, for more than thirty-five years with the Brandywine Peace Community. Mary Jo died with complete solemnity last March 2013. The 2014 Martin Luther King Day of Nonviolent Resistance was the first she missed in more than thirty-years.